Price: £4.85 (incl VAT) Sorry, this item is currently unavailable. Click here to receive notification when this product comes back into stock. Care Allergy Defence was formerly known as Nasaleze in the UK. 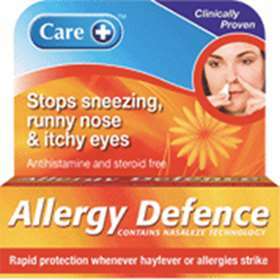 Care Allergy Defence provides natural allergy prevention and is a natural hay fever and allergy treatment. Care Allergy Defence treats the cause, not the symptoms. Stops sneezing and runny nose. Ideal for hay fever prevention. Relief from dust and pet allergies. Contains inert natural cellulose powder of vegetable origin. Care Allergy Defence is a unique, natural, nasal powder spray that works with your body's own defence mechanism to strengthen your resistance to airborne allergens such as pollen which are inhaled through your nose. Care Allergy Defence meets both the highest purity and safety standards, being a natural plant based extract. Studies have shown that by naturally enhancing nasal mucus, it is possible to filter out airborne allergens so that only clean air reaches the lungs. Care Allergy Defence works by forming a colourless, mucus-like gel lining in the nasal tract that acts as a filter for dust and germs. The unique blend of cellulose and peppermint acts as a natural barrier to airborne allergens whilst also having a pleasant minty aroma. Care Allergy Defence is suitable for adults and children under supervision. It does not contain any drugs or medicines. For most users one single squeeze per nostril is sufficient and will be effective for up to 24 hours. Recommended usage at least three times daily but can be used as often as required. Inert Cellulose Powder (Vegetable Origin), Peppermint Powder. Product code: 3285327 Price: £4.85 (incl VAT) Sorry, this item is currently unavailable. Click here to receive notification when this product comes back into stock.